The world today generates a total of 120 gigawatts of energy from wind, almost 1.5% of yearly global energy consumption. At the end of the next decade, this amount can rise up to 12% of the energy market with supportive government policies and innovative energy companies. Developed countries have long put wind in their energy agenda and set goals to expand their wind consumption. The USA is the leader of the race, and this year has 25 gigawatts of wind power capacity. The top five countries, the USA, China, India, Germany and Spain, cumulatively generate three-fourths of the world’s wind energy. One of pioneer countries, Denmark, has already exploited its capacity in building new wind parks, and generates one-fifth of its energy consumption from wind. Turkey ranks 25th with around 600 megawatts among 76 countries that generate wind energy on a commercial basis, according to World Wind Energy Association (WWEA) reports and produces 1% of its total energy from wind. Turkey has one of the best wind supplies in Europe after Ireland and England according to European Parliament’s wind index. “The same turbine can produce twice as much electricity when built in İzmir, Turkey then anywhere in Germany” says Prof. Dr. Tanay Sıdkı Uyar, VP of WWEA and Associate Professor of Renewable Energy at Marmara University, who first mapped Turkey’s wind atlas in the late 90’s. “Wind is the cheapest energy source for Turkey. It is four times cheaper than conventional energy sources when external costs are added,” he says. Wind turbines are rising fast on the western and southern coasts, in the cities of Canakkale, İzmir, Mugla, Balıkesir, and Hatay. Currently, there are 17 operating and 77 licensed wind parks. It took only a few years for Turkey to become one of the world’s most dynamic world wind markets. Turkey’s wind power capacity jumped from 20 megawatts in 2005 to around 600 megawatts in 2009. Upon the completion of the ongoing projects, “the capacity will soon add up to 700 megawatts,” says Tolga Bilgin, President of Turkish Wind and Solar Energy Investors Association (RESSIAD) and VP of Bilgin Energy Holdings. “Until 2001, all energy investments were done with Build-Operate-Transfer model, and the state bought all the energy plants in 20 years. 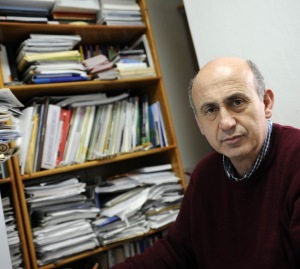 We planned the first wind parks in this system,” says Bilgin. But in the first half of the 2000’s, there was an economic crisis in Turkey, and when Electricity Market Law in 2001 liberalized energy markets, it took a while for the system to settle. The state also stopped purchase guarantees. The law was a blow to the progress of the wind power market, according to Bilgin. “Wind’s initial investment is expensive. Building 1 megawatt of wind energy costs 1,300,000 Euros. In order to find investors or financers, the government’s purchase guarantee is influential” he explains. Without the incentive, the wind investment stayed limited in the first half of the 2000’s. 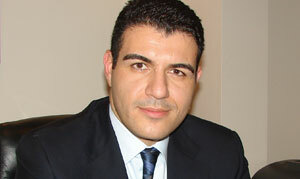 Tolga Bilgin, President of Turkish Wind and Solar Energy Investors Association (RESSIAD) and VP of Bilgin Energy Holdings. Despite the lack of government incentives, Bilgin’s company built Turkey’s first private sector 30 megawatt wind park with GE turbines in 2006. “Bandırma wind power plant increased the total capacity in Turkey by 150% from 20 megawatts to 50 megawatts. The success of Bandırma showed other energy companies that wind parks could operate successfully without the purchase guarantees. It paved the way for many other projects. During this period, 3356 megawatts of wind energy got licensed, out of which 567 megawatts are currently in working capacity”. Currently, Bilgin Energy is constructing four more wind parks, Mazı-3, Aliağa, Zeytineli and Soma, which will together generate 320 megawatts of wind energy when completed. With the amendments to the renewable energy law in 2005, the government started to offer feed-in tariffs for renewable energy sources: ten-year purchase guarantee of 5.5 Euro ct/kWh for electricity generated from wind energy. Although this price is lower than those of Turkey’s European counterparts and there are no other incentives, which has been criticized by experts such as Professor Uyar, Bilgin thinks this price is not bad for the wind power market. “This guarantee convinces the financers” says Bilgin. “After a wind power plant is built, there are no fuel costs involved, and the operation becomes low-cost. Energy companies can sell the electricity on the open market for 7.5 Euro cents/ kWh.” Since Turkey’s energy demand has been growing by around 8%, despite the effects of the global recession, Bilgin is optimistic that the markets will demand more energy in the near future and believes in the future of the wind park projects for investors. “Wind parks with the capacity factor of 40% would pay off in 5-6 years and start turning a profit,” says Bilgin. Bilgin also initiated the first carbon emission trade in the European volunteer markets and got credit for his eco-friendly energy wind park investment. “Each wind park project saves 70,000 to 100,000 tons of CO2 and we got certificates for not polluting the atmosphere” says Bilgin. Bilgin explains a number of Turkish energy companies got credits to finance their wind park projects with this method. 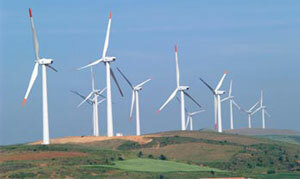 The progress in wind power market has also attracted global investment. “Since the world is focusing on wind power, and Turkey’s potential is high, foreign investors are showing interest,” he says. One current example is the US renewable energy developer Renewable Energy Systems (RES), which entered the Turkish wind power market with the acquisition of a 500MW portfolio of power projects worth €750m. After 2010, the wind power capacity will gain another strong momentum. Currently, the market is expecting the independent regulatory body, EPDK, to evaluate the wind power plant applications of November 2007. After a few years of not accepting any projects, there was a record 756 applications totaling to 78, 000 megawatts of energy. These projects are still being evaluated and the licensing process is estimated to be finalizede by 2010. “78, 000 megawatts of energy is twice the total energy supply of Turkey today. The eligible applications are around 32, 000 megawatts” says Bilgin. The grid infrastructure will allow only some extent of energy into electricity systems. Moreover, some projects which are planned for the same areas will be eliminated. “After all projects are licensed, Turkey can generate 12, 000 megawatts of wind energy by 2013. It is still a big investment for Turkey” says Bilgin. He also warns that some of these projects were completed in a rush, “The wind measurements are the most important and time consuming part of wind power plant planning” he says. Wind should be observed for at least 2 years. “Sometimes even two hills on the same land have different wind measurements.” he says. Wind parks are built in a relatively short time, one or two years; however they need meticulous planning. “It took us almost ten years to plan Bandırma Wind Park. Because of the high number of applications in 2007, the system got blocked. The market authority, EPDK, should be very careful and impartial with the evaluations, otherwise it can cost Turkey 4 to 5 years of progress in wind,” he says. A nuclear power engineer, Dr. Tanay Sıdkı Uyar, VP of WWEA and Associate Professor of Renewable Energy at Marmara University, is a public critiic of any nuclear and thermal energy investments. He voices Turkey’s renewable energy potential in national and international platforms. “Turkey can produce twice as much of its energy demand from the sun and wind,” says Uyar. Compared to conventional energy sources such as fossil fuels, coal or natural gas, wind is clean, green and renewable; wind energy does not pollute the air; it doesn’t produce atmospheric emissions that cause global warming. Wind is also renewable, which means it is endless and cannot be used up. Another advantage of wind as a renewable energy resource is that it is domestic. Turkey has long term agreements to buy natural gas from Iran and Russia. Turning to renewable energy to ease Turkey’s dependency on natural gas is one of the goals according to the Medium-Term Program (2010-2012) prepared by the State Planning Organization. The government target is 20, 000 megawatts of wind energy for 2023. Uyar agrees that Turkey has the potential to increase its wind capacity. He also warns against government plans for new nuclear energy plants. Ironically, the Medium-Term Plan also targets giving a start to building nuclear plants until 2012. “Developed countries have long abandoned nuclear plants. These outdated technologies should not be imported to Turkey” says Uyar. “The USA ranks in the first place in wind today. The USA has not allowed any new nuclear plants since 1976, and now is in the process of dismantling some of the older ones. Recently, it also regulated the licensing of thermal plants and disapproved of 100 projects. Turkey should not import these technologies because they generate more social and external costs. Sun and wind are the answers,’’ he says. Uyar is also the coordinator of the nationwide green NGO called TÜRÇEP, where regional organizations share information on health hazards and environmental effects of conventional energy resources. Support for thermal energy policies alarms Greenpeace as well. Hilal Atici from GreenpeaceAkdeniz is concerned about the government’s plans to build new thermal power plants. Turkey’s carbon emissions increased by 136% between 1996 and 2007 but since there is no requirement for Turkey in Kyoto Protocol, the government has no clear vision to lower its carbon prints. “The government should encourage green energy over thermal and nuclear. Greenpeace is demanding the yearly carbon emission growth to decrease by 25 percent” says Atici. Greenpeace also has an internet petition against government plans of to build 47 new coal-based thermal plants. Greenpeace recently declared an alternative energy scenario for Turkey called the Energy ®evolution, showing how Turkey can develop with renewable energy.